Let's Climb Higher in 2010- Starting Now! Hold on- we're just getting started! Hi everyone! It’s that time of year again, when we ask for your support with our fundraiser for Dr. Hall and Susie’s Art Cart. This year we have some new and exciting things to share. First, Samantha has officially joined me this year with our fundraising! 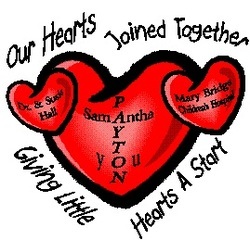 She has been helping out in the past, but this year, we are making it official with Payton and Samantha Allen’s 4th Annual Fundraiser for Mary Bridge Children’s Hospital! Second, Mary Bridge has set up a webpage for our fundraising. They have created a webpage that will allow everyone to follow our fundraising efforts and to see what our fundraising is all about. You may make your contribution online and it also allows everyone to send us “words of encouragement.” We will get daily updates on who has visited the site and how much we have raised, so make sure you send “words of encouragement” when you visit the site so we know you have been there. Third, we had so much fun last year creating a slide show/video and rock climbing- we have decided to do the same again this year! The only change is that we will be climbing outdoors! We have already started our climbing and now we would like for you to join in. 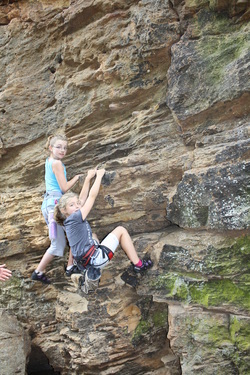 Help us “climb higher” for the kids at Mary Bridge. Last year we had a record year! Your generosity was overwhelming! So, this year, we are asking for your support again. Please send us your email address so you may enjoy the slide show and please visit our webpage. And if you prefer to make your contribution to us directly- that is great too! Just send your check made out to Mary Bridge Children’s Foundation in the enclosed self addressed envelope and we will make sure Mary Bridge sends you a tax receipt. Feel free to spread the word to anyone and everyone! We had 9 different states and Argentina make contributions last year- let’s see how many more states and countries we can get involved this year!!! Hi everyone! We have been so excited to send you an update- but with the rain and heat, we thought that we would never get to climb. Of course, the rain did not stop you! With 4 outdoor climbs under our belts, we are over halfway to our goal this year!!! Currently we have raised over $3800 on our webpage and through the mail for Dr. Hall and Suzie's Art Cart! Of course, our fundraiser isn't over. The rain has stopped and the heat isn't keeping us away from anymore climbing opportunities. So, this year, we are keeping our fundraiser open a little longer. We have decided to keep "climbing" through the month of September. So, there is still time! We are planning another climb in September so you can still help us. You may make your contribution online at our webpage www.multicare.org/foundations/pages/payton-and-samantha-allen-climbing-higher or you may send it directly to us and we will make sure the hospital receives the donation. Thank you in advance for your support! Enjoy our new slide show- Maui had lots of bouldering/free water soloing opportunities that we couldn't pass up! Our slide show shares our fun! Share the word and share our love of climbing! 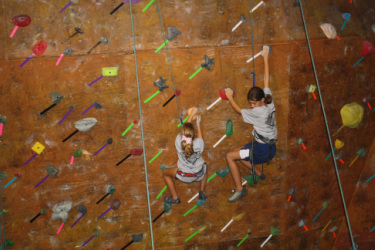 Dallas Rocks (www.dallasclimbing.com) is opening it’s doors on September 18 from 10 am-9 pm for our Climb-a-thon. The gym is donating 50% of the day’s proceeds to Dr. Hall and Susie’s Art Cart! We are so excited and can not wait to get everyone involved in climbing. A day pass at the gym, plus climbing gear, is $15 and you may climb for an hour or all day. We will be there all day so we hope you can make it! We will also have T-shirts for $10 (cash only, please) so everyone can remember the day and be reminded of the children that will be smiling due to your generosity. Oh, and don’t forget to watch the 10 pm news on Channel 8 (if you are local) on September 10-see Wow page. They will have a short interview segment with us explaining the fundraiser and how you- our family and friends are supporting us in our journey to help children in their healing process. Thank you all for your continued support and dedication. Our fundraiser would not be success without each one of you. Let’s keep climbing! 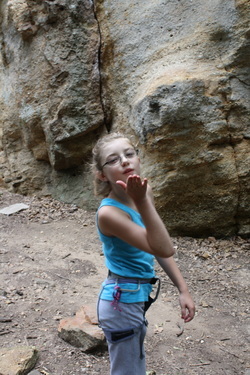 Climbing hard, so catch this kiss! Hi everyone! We apologize for the delay, but contributions just keep rolling in so we wanted to give everyone an accurate 2010 Climbing Higher amount. We are truly blessed with the love and support that everyone gives us each year! We are so thankful that each one of you is in our lives and that you continue to help our fundraiser grow. Dr. Hall and Susie's Art Cart will be filled with over $8,000 worth of art supplies this year as a result of your generous contributions!!! Now, if you look at our webpage, do not be disappointed. We had many contributors give in the mail so our total on the webpage is not accurate. Thank you so much for helping us expand this year! We know that our fundraiser would not be successful without each one of you. And we apologize in advance if we left anyone out in our video- Mommy had so much fun putting together the video with her new computer this year, but production was cut short due to a drink spill. No worries, the computer will be up and running by next year, but we did not want to delay any longer with our success from this year! Please let us know if the file is too large to open- again, Mommy had so much fun creating it, she went a little crazy. She should be able to make a smaller version for anyone who needs it!